Antigua’s history is fraught with tales of natural destruction and man’s perseverance to rebuild in the aftermath. Spanish conquistadores reached the region by the mid-1500s, subjugating an already broken Mayan empire. Despite a series of destructive mudslides and earthquakes that devastated the city, Antigua (then called Santiago) continued to grow, becoming an important city over the next hundred years. 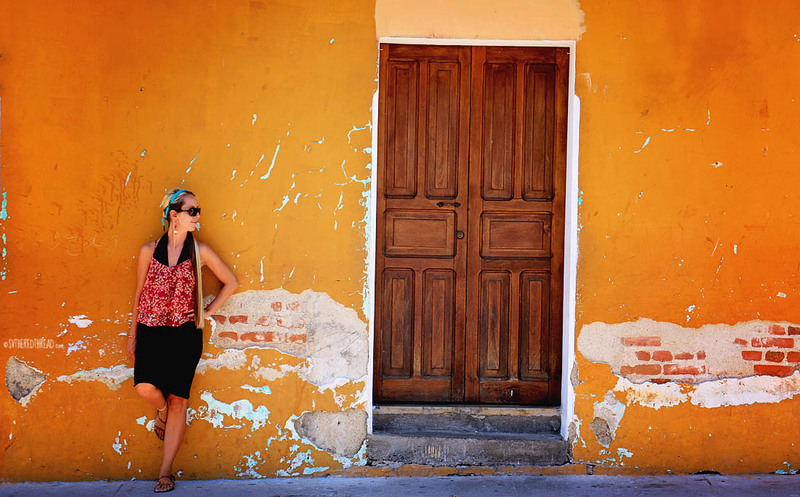 Antigua is perhaps the most colorful city we’ve ever visited. From the vibrantly painted buildings to the kaleidoscope of colors that characterize traditional Guatemalan dress, the city is a feast for the eyes! Around nearly every street corner is evidence of the city’s relationship with the Gods. Carvings of deities intermingle with facades of regal cathedrals. Women wearing tightly woven fabrics of magenta, indigo, and tangerine pass women with crosses dangling from their necks. 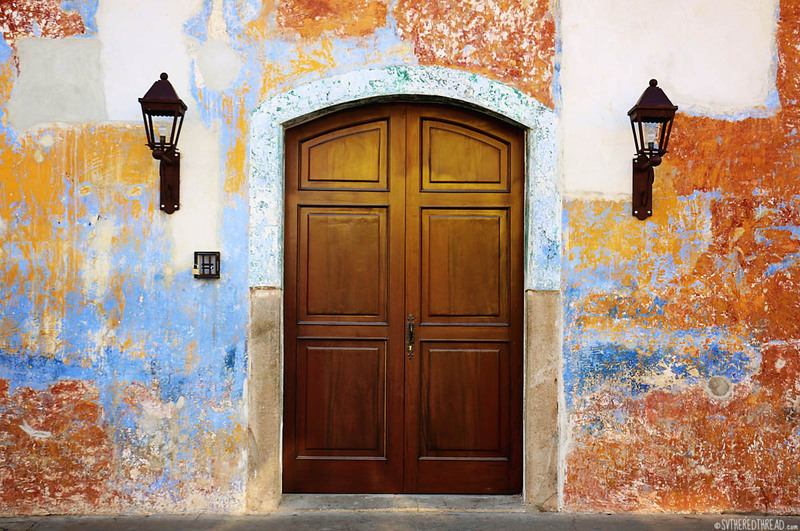 It is said that Antigua’s majesty is hidden behind her walls, but it’s hard not to be enthralled by all that can be seen in the streets and even in the character of the walls themselves! Antigua is also a tourism darling and, at moments, felt a bit too flawless, to me. It was as if it had been overly polished to satisfy the critical eyes of tourists. 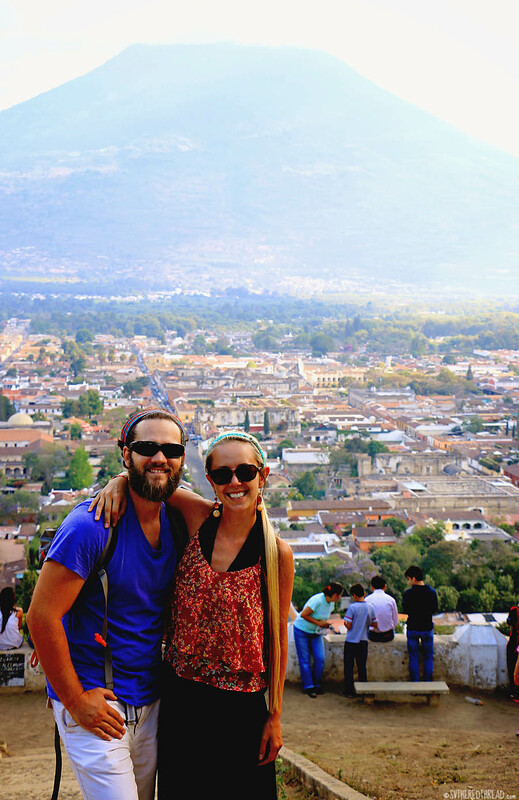 Neil experienced the city differently and found it to be the most charming of all the cities in our travels together. 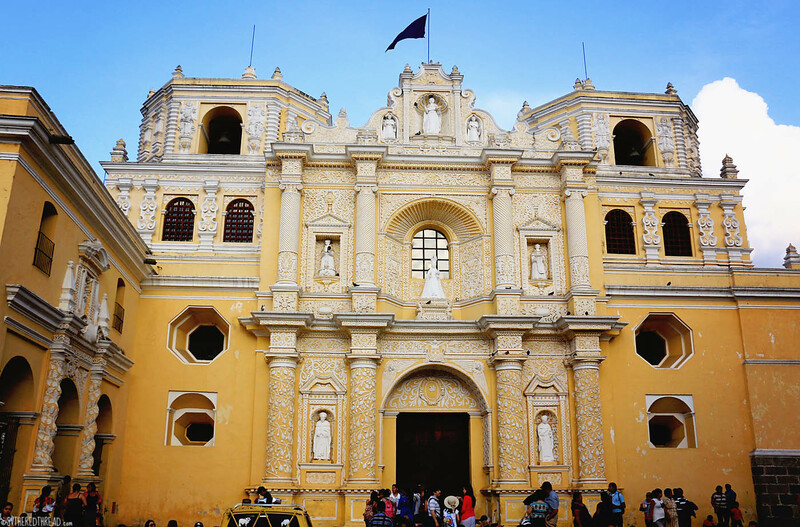 As the flurry of activity that culminated during Good Friday began to mellow and Guatemalans prepared for the merriment of Easter Sunday, we redirected our energy away from participating in the festivities and spent time simply enjoying the city. We stayed at Bigfoot Hostel in the heart of the city, which made rolling out of bed and wandering aimlessly our morning delight. 1. Parque Central: Antiqua, like most Latin American towns and cities, revolves around a town square, the Parque Central. A picturesque fountain marks its center and benches beneath shady trees abound. Historical governmental buildings, modern restaurants, and the façade of the city’s main Cathedral fringe its perimeter. Numerous souvenir stands dots the southern portion of the square and locals wander among the tourists selling their wares. At times, it’s easy to become overwhelmed by the almost incessant goods peddling. We met two adorable young girls whose curiosity about my long blond hair was of more interest than our purchasing potential. 2. 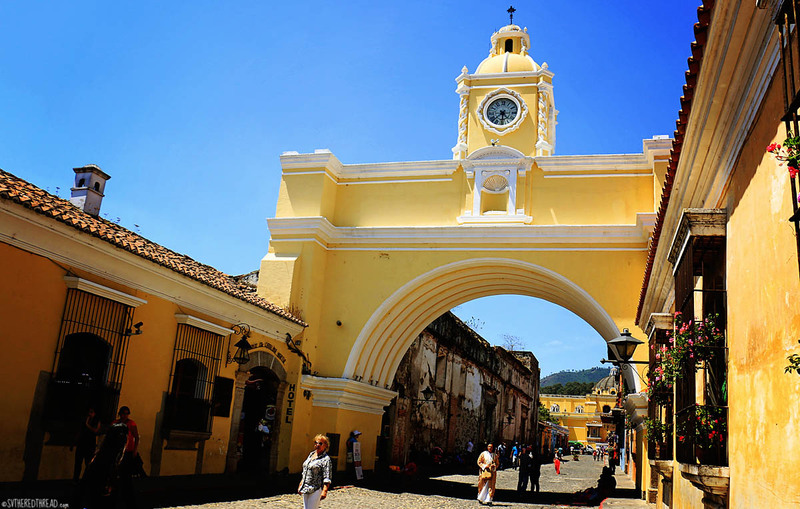 Arco Santa Catalina: Constructed in the 17th century to enable cloistered nuns to pass between convents on either side of the street, this iconic structure creates a picturesque frame for photos of Volcán de Agua. Today, a glance down 5a Avenida Norte will charm you into a smile, reorient you when you get confused about where you are, and signify that you are near Tabacos y Vinos, a small wine shop whose cellar even holds wine from Washington State! 3. Cerro de la Cruz: A 30-minute walk from town, up a hill and several flights of stairs, is a grassy hill lookout that offers panoramic vistas of Antigua and the mountainous crib that cradles her. We visited in the late afternoon, but a sunrise visit with fewer visitors would’ve made the view all the more lovely. 4. 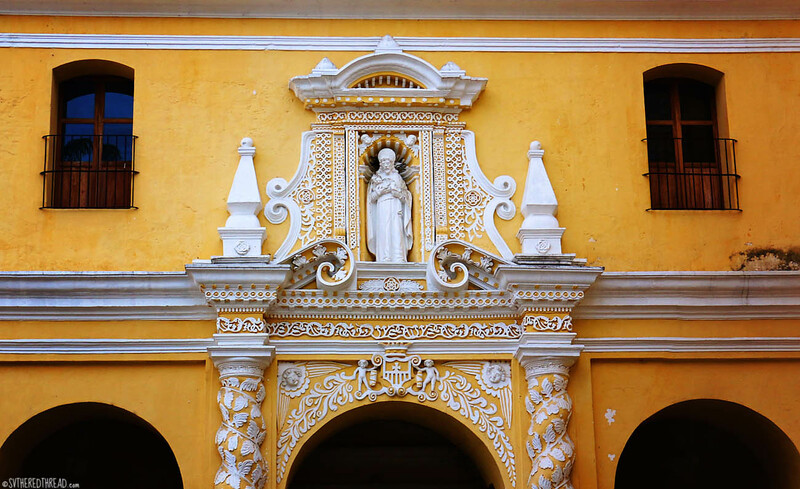 La Merced Church: This baroque-style church built in the 1700s and was the site of one of the first monasteries in Guatemala. Some of the walls are reportedly as thick as a meter, a design decision that helped spare the church from complete decimation during the 1773 earthquake that violently maimed many of the city’s other buildings. Lavish plasterwork patterns and sculptures upon a yellow façade lend a delicate flair to the grand building. During construction, Mayan artists reportedly added sculptures of corn and chayote, which were supposed to have been grapes, and carved indigenous features into the faces of angels. Good on ’em! 5. 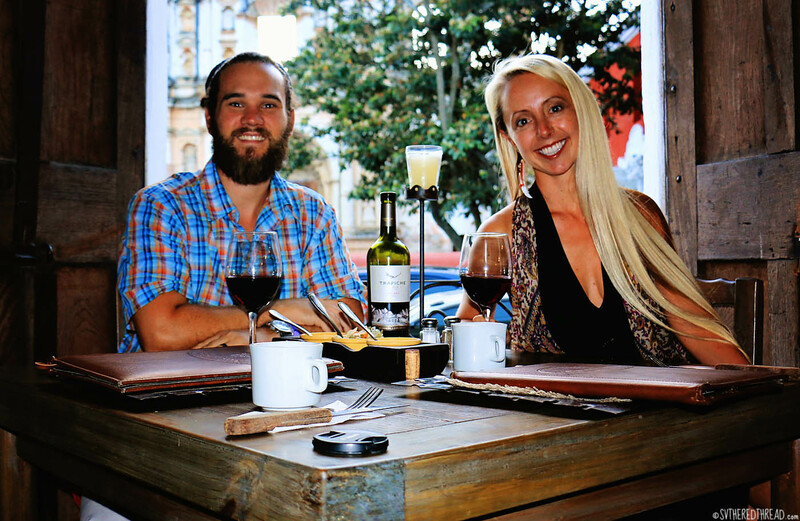 Casa Escobar: To celebrate six months of cruising, we treated ourselves to a swanky dinner. We might have convinced ourselves to be more prudent in selecting a restaurant, but we stumbled upon reviews of the steakhouse, and our decision was made. We honestly had not had a decent slab of beef since departing Seattle, and the temptation of good red meat was irresistible. And there was a fondue-like cheese dip with hearty sausage on top, so we needed that, too. And a bottle of Argentine Malbec. If you visit Antigua and are in the market for a posh meal. Casa Escobar is the ticket! 6. Iglesia y Convento de Santo Domingo: Built in the 16th century, this monastery was destroyed by the 1773 Santa Marta earthquake. Today, the ruins have been renovated into a hotel (Casa Santo Domingo) that is a museum as much as a place to spend the night. Beautiful ruins, a few shoddy looking macaws, numerous centuries-old statues, and what I believe was an apparition o’er a trio of carousel horses made our visit interesting. 7. 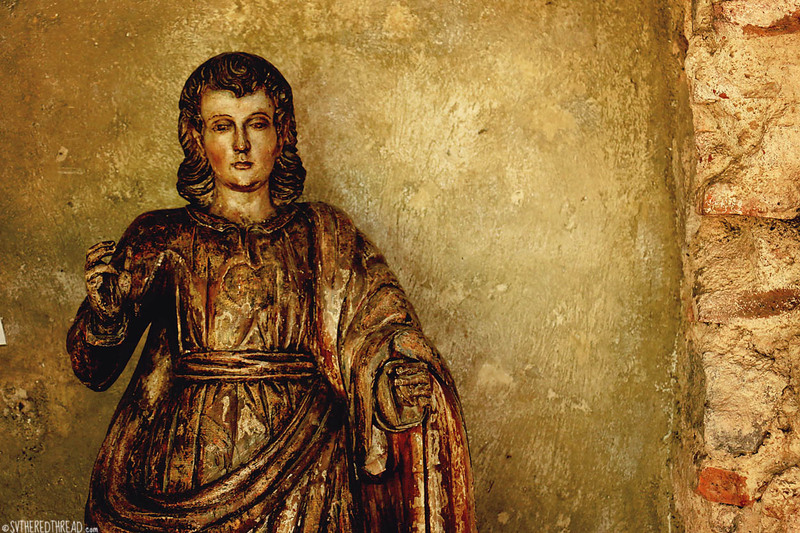 Cathedral ruins (Q7; $1.15): The ruins are a beautiful clutter of decaying stone from which new life had sprung in the form of small sturdy leaves and golden flowers. Centuries of exposure to the elements has dulled the intricately detailed stonework, but many details are still evident. Earthquakes in 1717 and 1751 damaged the structure, but after both incidents, the cathedral was rebuilt. After 1773 earthquake rattled the city, however, the damage was too vast and the cathedral was left in ruin. 8. 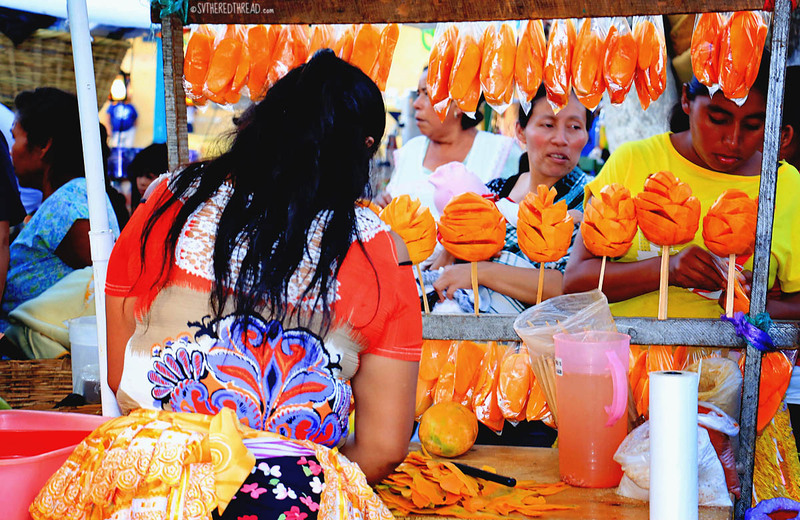 Handicraft markets: Charming headbands, frilly dolls, colorful handbags, hand-carved masks, and countless other trinkets can be found in various places throughout the city. While large indoor markets abound, we were drawn to the outdoor carpet markets, where women sat beside their wares beneath the shade of crumbling churches other ruined structures. The crafts in Guatemala have a distinct flavor, and we bought more souvenirs than we cared to carry. We found vibrant placemats for Neil’s mom and a nativity scene and embroidered pouch for mine — gifts for Mother’s Day. We bought a beautiful mask for The Red Thread, dollies for friends’ daughters, and a pair earrings as a gift. 1. Coffee tour: One can never know too much about coffee. Period. 2. Chocolate Museum: No further explanation necessary. 3. Convento de las Capuchinas: I would have loved to have explored this 18th century convent where several dozen nuns once resided. The nuns’ actions were regulated strictly. They were required to survive on donations alone and to maintain strict routines that demanded penance and fasting. 4. 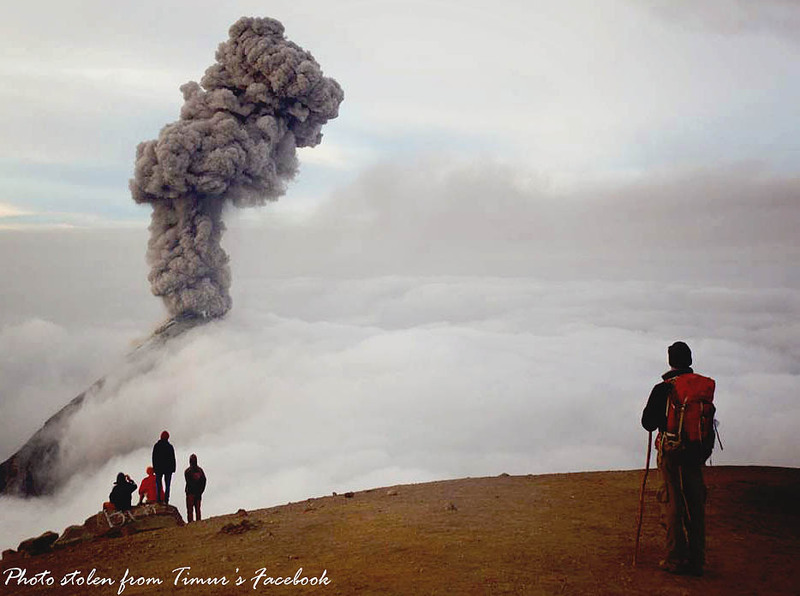 Volcan Acatenango: Scaling this 13,040-foot tall beast would have been a tremendous experience! We only realized the awesome opportunity we’d missed after we left Guatemala and met several backpackers who had reached its summit. Imagine camping atop this spectacular volcano and waking up at dawn to see smoke spewing from the crater of Volcán Fuego to the south, the precise experience our friends Tim and Emma described. A stone was rolled away as Easter Sunday dawned bright and glorious. 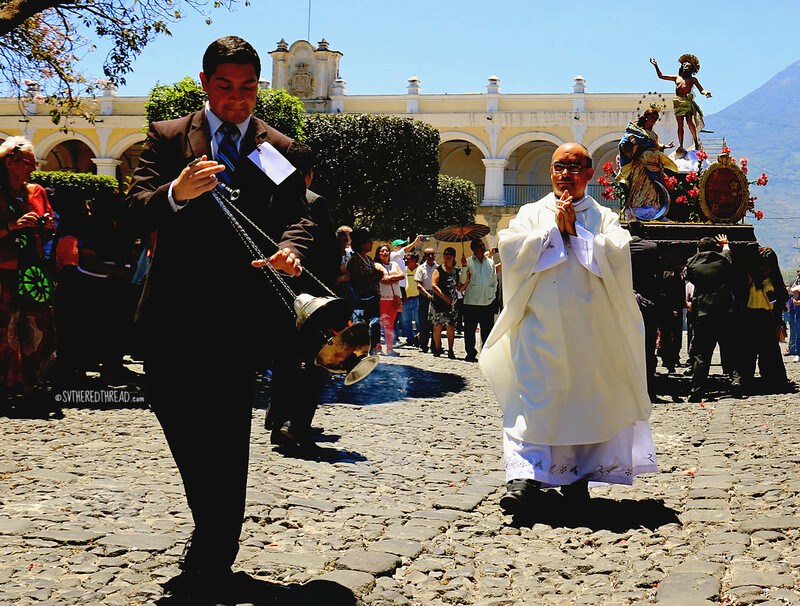 Floats again took to the streets, with colorful flowers dancing beneath Jesus Christ’s outstretched arms. The city was vibrant and alive with an intensity that was palpable. 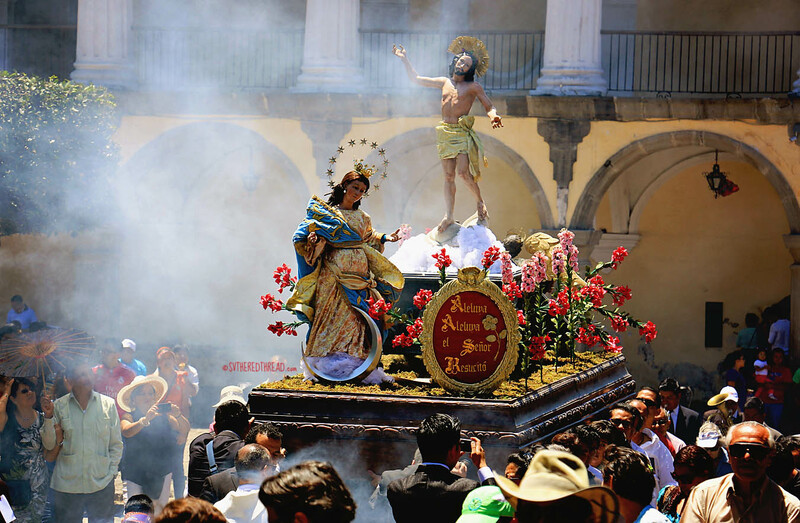 The atmosphere in the city truly felt resurrected, as the somber ambiance that had cloaked the city in remembrance of Christ’s crucifixion was lifted. Joy for his redemption flooded the streets. The following morning, we rose at 4 am and wiped the sleep from our eyes. After several beautiful days in Antigua and far too little time in Guatemala, we were bound for western Honduras. This entry was posted in By Jessie, Central America, Guatemala, Inland Adventures and tagged Antigua Guatemala, Arco Santa Catalina, Bigfoot Hostel, Casa Escobar, Cerro de la Cruz, Easter Sunday, Iglesia y Convento de Santo Domingo, La Merced Church. Bookmark the permalink. Beautiful, colorful photos! Are the items at the food stand on sticks, mangos? Or something else? Fantastic. Love your blog and story telling. Be safe out there on big Blue. How lovely! We are very much looking forward to Guatemala. Our oldest is there now, staying for three months on Lake Atitlan. She and her boyfriend love it and will definitely be back. Now I have to go search your blog to see where you left your boat. Enjoyed reading your of experience in Antigua. I’ve been to that colorful city a couple of times. The last about 10 years ago when Barbara spoke there to a gathering of Protestant missionaries from throughout the country. Keep up the safe travels. My daughter went on a mission trip to Guatemala this summer. She fell in love with the children and can’t wait to return. 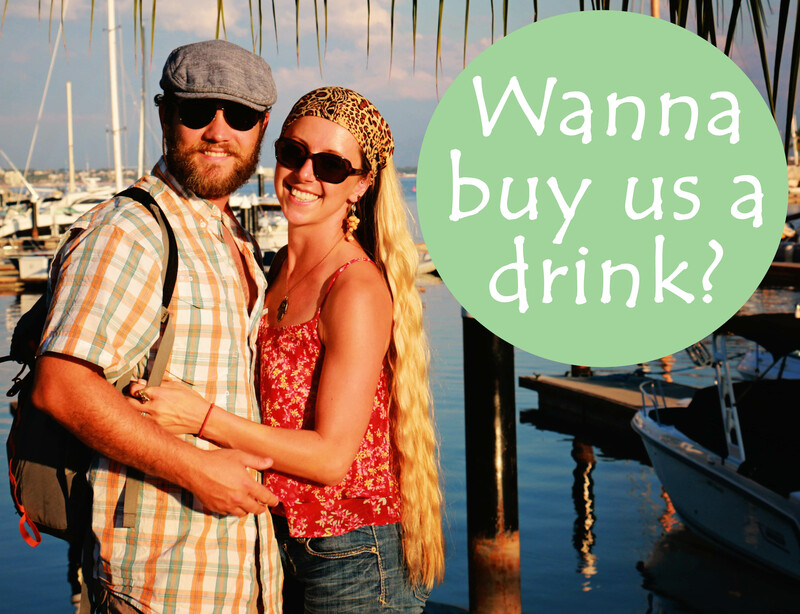 Thank you for sharing all your travels!